_ (Update via Canadian Heritage Feb. 16) _ Mother Nature is at it again! The weather conditions are forcing the Rideau Canal to close until further notice, so updates regarding the 38th Annual Accora Village Bed Race and the Waiters and Waitresses Race planned for this weekend on the skateway will be shared on our Twitter feed. 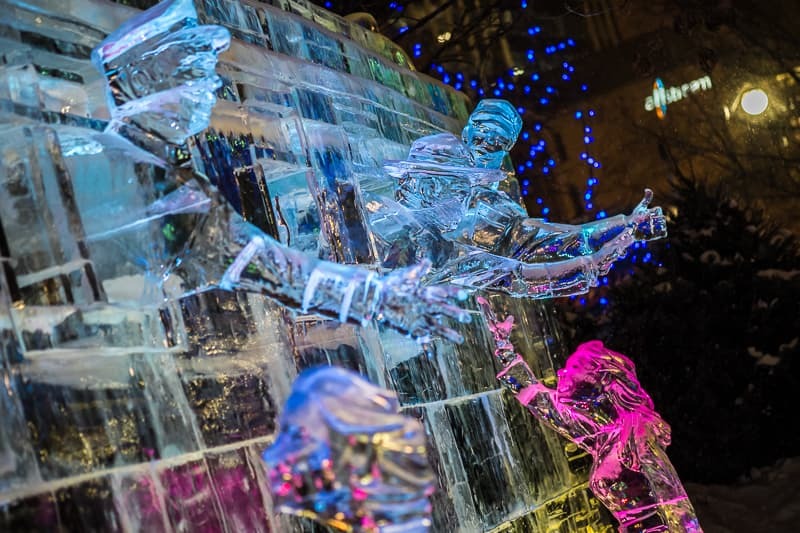 Changes in Winterlude programming are also to be expected, but there’s still a lot happening at the Snowflake Kingdom on the north end of Jacques-Cartier Park in Gatineau and the Crystal Garden at Confederation Park in Ottawa! Two of the three Super Tube Slides at the Snowflake Kingdom are running, and although the introduction to downhill skiing and snowboarding is cancelled, you’ll still be able to catch the Extreme Aerial Acrobatic Show inside the shelter tent. What’s more, on Sunday you’ll be able to try the Corps Cadets 2920 Gatineau Obstacle Course! The programming planned for the Crystal Garden remains unaffected. The International Ice Carving Competition Carvings are still standing and the Public Ice Carving Challenge will go on as planned on Saturday at 11:30 a.m. The Sub-Zero Concerts will go on at 7:30 p.m. with the Hip Hop Soirée ICI Musique on Friday and Juno Award winning Francesco Yates and DJ Vito V on Saturday. The fun will continue on Monday, February 19 on Family day in Ontario with the Annual Family Day Skating Party on the Rink of Dreams at Marion Dewar Plaza! Artists from the Sub-Zero concerts are available for interviews, and Spokespersons from Canadian Heritage are also available to discuss the highlights planned for the third weekend of Winterlude. – _ (Original story via Canadian Heritage) _ An array of activities—reflecting both Canada’s Capital Region and the country as a whole—have been planned for the winter celebration’s three official sites. Snowflake Kingdom, sponsored by Tim Hortons, will offer visitors a new experience, as the official site is being relocated to Gatineau’s Jacques-Cartier Park North. Visitors will still get to take part in the fun winter activities they are used to, such as the super slides, but the site will also feature fun Nordic activities and unique performances for kids of all ages. Winterlude Kick-Off Celebration, starting at 7 p.m. on February 2. A laser show will wow the crowd on opening night, along with DJ 4Korners, the official DJ of the NBA’s Toronto Raptors. annual Enbridge Pancake Breakfast, and the OLG All for Skating shows, with special skating performances by the Embassy of Germany in Canada on February 3. Winterlude runs from February 2 to 19, with all sites open for Family Day in Ontario. The Sub-Zero concerts (Fridays and Saturdays) will feature a Silent Battle of the DJs, Aaron Pritchett, the Boogie Wonder Band, DJ Abeille, Koriass, Dramatik, King Abid, Philippe Fehmiu, Francesco Yates and more. OLG is the presenting sponsor of the Rideau Canal Skateway and Official Sponsor of Winterlude; Tim Hortons is the sponsor of the Snowflake Kingdom in Jacques-Cartier Park; and CircleK is the sponsor of the main stage in Confederation Park, known as the CircleK Stage. Winterlude would not be possible without the support of around 700 volunteers. Visitors are encouraged to make their way to the Winterlude official sites with the free OLG Sno-bus service.